It was in the last season of the UEFA Champions League Round of 16 that Real Madrid completely chose to ignore a 21-year midfielder Francisco Roman Alarcon Suarez, also going by the name of "Isco", in the starting XI. As long as Angel Di Maria occupied the central and left positions in the midfield there was no question of the young Spaniard from Malaga being considered at all. But it was Real's loss for those moments they kept him on the bench. Since the departure of Di Maria, Isco has re-invented himself by playing in various positions and emerged as one of the most creative midfielders on the Spanish football scene in recent times. That the fans of a rival team, Elche, gave him a standing ovation when he left the field at the Manuel Martinez Valero stadium is enough testimony to this young player's on-field abilities and rising popularity. Isco more than just filled Di Maria's shoes. 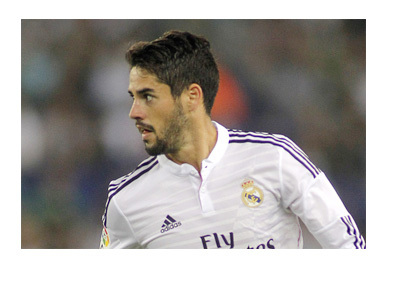 Isco's exceptional abilities of dribbling, passing and ball-possession have at last been noticed. Playing alongside Luka Modric and Jamie Rodriguez in October 2014, he was instrumental in delivering one of Real Madrid's most poignant triumphs of the La Liga season, a 3-1 win against bitter Catalan rivals Barcelona. The injury of Luka Modric in November last found the young Isco take up a vital role in place of the Croatian star and an important component of the midfield trio comprising Toni Kroos and Jamie Rodriguez. Isco has indeed lived up to his role since then. He has featured in the starting XI for Real in 86 per cent of the matches since Modric's injury. His 5 goals from 37 appearances for Los Blancos don't tell one of the importance of Isco in the club's scheme of things. For someone who was unveiled at the Bernabeu on 3 July 2013 and spent considerable amounts of time on the benches after that, it has been a huge jump to becoming the "go-to man" for Real Madrid. Problems for manager Carlo Ancelotti will start with the coming back of Modric, keeping in mind the indispensability of Isco. In the attacking triumvirate of Ronaldo, Benzema and Bale there could be pressure on the former Tottenham man to perform and if worst comes to worst Isco could be called on to become a part of what is considered the most potent attacking trio in world football now. Ancelotti's faith in Isco is complete and considers him an absolute necessity in any attacking strategy for Los Blancos. He goes on to state that Isco is a vital member of Real's starting XI and even a return of Luka Modric will not change that a bit. In fact, Isco's evolution into a phenomenal midfield talent could give Ancelotti second thoughts about the injured Croatian's return to the Los Blanco's starting line-up. It's indeed been a meteoric rise for the 27 million Euro 2013 signing from Malaga and his value at Bernabeu will just keep shooting the way things are going for him.